If mixed martial arts promotions could form super groups the same way rock bands, consider the newly formed Legacy Fighting Alliance to make the short list of promotions that merged two iconic brands. It was announced today that Mick Maynard’s Legacy Fighting Championships (Legacy FC) and Resurrection Fighting Alliance (RFA), ran by Ed Soares, have merged. 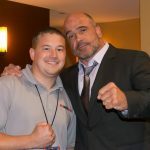 Soares will lead LFA and be joined by former Ring of Fire and RFA executive Sven Bean who will act as COO. With UFC matchmaker Joe Silva set to leave the organization in the near future it has been speculated that Maynard will fill the role. There is no confirmation of this as of yet, however it would make sense that if Maynard did take the position, his role with Legacy would have been impacted, thus it makes perfect sense and timing to merge with RFA.